Okay, so you've arrived at your camp spot, you park the trailer, but when you get in, do you find youself having to worry about motion sickness because your tiny trailer rocks and rolls so much? A month ago I wrote a blog post on trailer security, making sure your lovely tiny home doesn't get stolen. This post is about just making sure your trailer has a stable foundation as you enter it, move around and around up and down in it, and then leave it. Although your tiny home is mobile, it doesn't have to be a trampoline experience! Here is a list of equipment to use to make your camping home feel (and be) more stable. Mounted stabilizers. My tiny trailer came with mounted rear stabilizers. They are angled and meet the ground at about a 45-degree angle, which lessens side-to-side sway, although some just slide straight down. I just pull mine down, but some larger RVs have scissor-jack stabilizers. Portable (stacking) stabilizer jacks. I use these for the front of my tiny trailer. I didn't for the first few trips but then realized that the front swivel jack (with the wheel) created a triangular foundation that was susceptible to rocking. The jacks lessen that. Stabilizer jack pads. Sometimes the ground is pretty soft, so there needs to be some kind of pad to keep the jack foot from sinking into the ground (thus making the stabilizer ineffectual). I have a pack of four. You can see my yellow jack pads in the photos above. Wheel chocks. You don't want your trailer rolling down a hill once you've unhitched it. Wheel chocks keep it sitting where you want it. One of my wheel chocks is also a security lock. That's not in the photo below because I mounted it on the tire not raised by wheel blocks. Leveling blocks. Even flat-earthers admit the earth, while not round, certainly has its rolls. Leveling blocks help ensure that the lateral lean of the trailer is, if not non-existent, at least minimal. Leveling blocks and wheel chocks. Tongue jack wheel dock. I know some who use this to keep the wheel from moving around or sinking in wet conditions. I don't use it because often there is not much space between the tongue jack's swivel wheel and the ground. If the ground were soft, though, I'd have to improvise with a piece of wood or stabilizer jack pad or one of my leveling blocks. A leveling device. How do you know your trailer's level? I just use a small, 8-inch carpenter's level. I had mounted bubble levels on the trailer frame, available at Wal-Mart, but was never sure about how accurate they were . . . and then they didn't stick. For me, the carpenter's level is enough. I slap it on the tongue to determine whether I need leveling blocks to level side to side, and also how much to raise or lower the tongue jack to level the trailer front to back. I also double check by slapping the level on the counter and floor inside the trailer prior to finishing off the leveling job. The above items are what I use to create a foundation for my trailer that is safe and sound. I'd sure like to hear if other campers have something useful that I haven't mentioned. After forty-eight years of marriage, Mark and Irene Busha’s travel itinerary is to do what they like and like what they do. They’ve camped together, traveled to Europe together, camped alone, and traveled to Europe alone. Ah, the comfort and stability of a lifelong relationship! Southeast Michigan is their home, but the world is their backyard. Started by adding a front window and portholes. 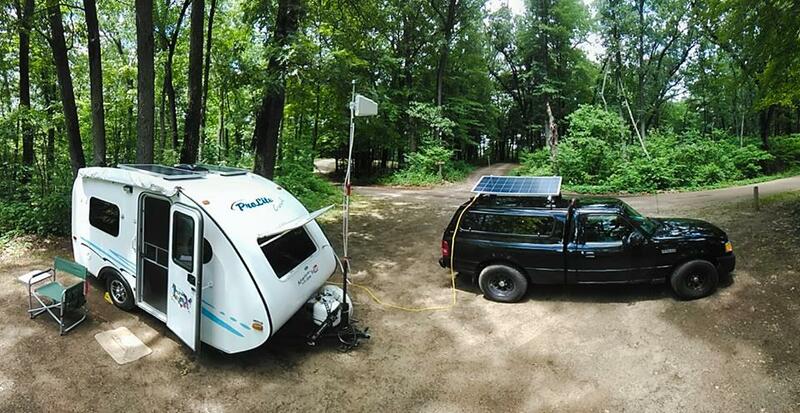 200W of Renogy solar on the trailer and another, tiltable, 160w panel on the Escape. MPPT charge controller. 200ah in two AGM batteries. Whynter (compressor type), 45-quart refrigerator. Propane tank for now, permanently mounted, stove and Camco Wave 3 heater. Also, Tank Check Bluetooth gas level indicator. Large sliding storage drawers under the bed and dinette. 10-gallon freshwater tank, 12v pump, and small bar sink. Modified the 3 speed Fantastic Vent with a PWM variable speed control. Best $7 bucks you can spend. Changed frosted door window to deep tint and got rid of the silly curtains for blackout shades. WeBoost cell booster, AT&T hotspot, and Wilson directional antenna. TPMS, Tire Pressure Monitoring System. Learned the hard way! Learned the advantages of a Luggable Loo. Best system on any trailer we have ever used! Irene approved! Mark Busha is the administrator of the Facebook group “Teardrop Camper Adventures.” Even with all his experience, he maintains a balanced attitude about learning how to enjoy the tiny trailer camping life: “While fun to read, don't take to heart the experts on FaceBook! :-)” Learn, enjoy . . . and dream? Well, he also says, that being almost seventy years old, the Jessie Ventura quote is pertinent: “I ain't got time to dream!” You don’t have to dream about Mark and Irene’s adventures. You can follow them on YouTube on Mark’s travel channel, Adventures with Jane. As of this October 2018 posting, Mark and the Prolite are already off on a new adventure of the American West for six months or more. “Fourth trip around the country with the ProLite. 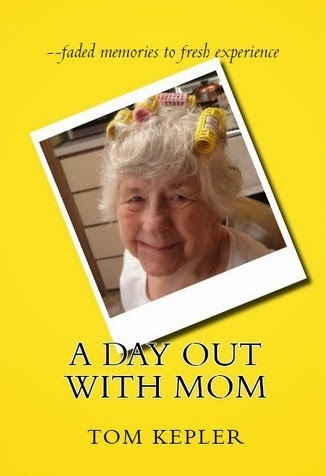 Irene is staying home and opting for a European vacation instead. With an internet connection, we talk every day. Actually seems to work out really well.” And may they meet up on the Pacific coast to share a sunset, just like in the Hollywood movies. 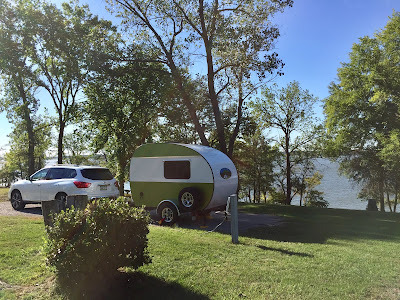 When I named this blog "Green Goddess Glamping," I did so because the title defined for me what I wanted and needed from a trailer camping experience. Of course, I have my personal definition of glamping that also impacted my decision. I know how to get down and dirty with camping . . . something unavoidable at times if you bicycle camp, as I do. Show up sweaty and dusty at a campground with no shower, then "bathe" by tossing pots of cold water over your head. Go to sleep, have a thundershower pass during the night, and then wake up to a campsite muddy instead of dusty. Eat pre-packaged food heated over a one-burner alcohol stove or a sooty hobo stove. Spend fourteen hours of winter darkness in the tent, waiting for dawn and something to do, having already slept yourself to boredom. I bought the Green Goddess, though, to camp with my wife and to have a cleaner, easier camping experience. That's how I decided that the word glamping was appropriate, although some people will say, "Glamping, but your trailer doesn't have a bathroom or kitchen. It's 10 x 5, including the bed!" My initial experience with tiny trailer camping came about when a woman named Ann whom I met while bicycle camping said to me, "Well, I've finally met someone camping with a smaller setup than me!" Yes, a one-person backpacking tent is small! That woman owned an RTTC teardrop, Grizzly model. I was curious when the great outdoor equipment co-op REI decided to publish an article titled "Glamping 101: How to Go from Camping to Glamping." Would their definition fit mine? Will they say I'm a happy glamper or just a wannabe? I was pleased with REI's definition of what constitutes putting the glamour into camping. It's a spectrum, they say, from "uber-luxe" to "cozy." 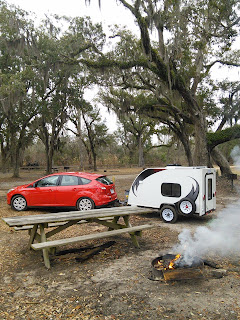 Well, that fits my tiny trailer experience with my wife--warm, dry bed, portable toilet for nighttime trips, two-burner stove for outside cooking, some electric cookgear that can be used inside or out, and an inside heater or ac as needed. REI lists seven DIY glamping tips. I would add that to glamp up the outdoors experience, you should bring those things that allow you to unwind. Leave your stresses at home, but don't replace them with survival stresses. Find a way to minimize heat/cold, bugs, wind, rain, humidity, and an environment with too many or too few people, depending on your individual needs. Bring some company, whether it be the pooch, a friend, or one's significant other. Or go out and wander alone, if that suits your needs. Let's look at these seven tips in terms of my wife's and my "glamping" experience. Cozy bedding The first thing my wife did was buy new foam for our bed and table unit, redesigning the layout to better fit our needs. Then we bought a wool mattress pad that really added "cozy" to our sleeping experience. When we set up our table, we just fold back the pad and leave 75% of the bed made. Right now, we are also bringing our sleeping pillows from home. Touches of home We ordered a couple of 16" x 16" pillows of us and our grandkids from our trip to the Pacific Ocean. Now, no matter where we camp, a bit of home and family is right there beside us. We are also using as much tent-camping equipment as we can, which not only saves money but also provides a sense of continuity (and emphasizes our newfound sense of "cozy"). A Cuisinart tea pot for mornings really extends that sense of home since my wife starts every morning with a pot of tea. Light Well, I have added a little stick-on tab for a battery-operated reading lamp for the back of the trailer. It's also a novelty still for us to have the trailer's electric lighting system. However, our biggest addition of light is having a nice campfire to sit by. That is a special time for us. Comfy living room I suppose we're still working on this, but the campfire, the trailer's awning, a utility tent for the portable toilet, and a couple of comfortable camp chairs (thanks, REI) do add to the comfort level of the camping experience. We are still looking for a rug for under the awning. From our research, the trend is more toward gaudy than glamourous. 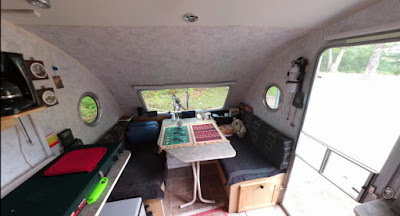 Our main "comfy" addition with the trailer is having ac and heating possible, thereby increasing the number of days we are willing to camp and not cope. Gourmet meals We are working to continue our good meals from home. We eat fresh, healthy meals at home, and we want to continue that--not so much macaroni salad, even though we love it. We bring our Instapot pressure cooker so that we can make a quick and easy kitchari of greens, rice, and dahl. We are also researching the suggestion make to buy a portable induction cooking burner. My wife recently purchased a small toaster oven so she can bake chicken. Stations At this point, setting up "stations" beyond the obvious of cooking and portable toilet comes down to having a "station" with binoculars, and bird and tree identification books. I want to learn more so that I can have a fuller experience than just saying, "Pretty tree. Pretty bird." What kind of tree or bird--a pin oak? A goldfinch? Entertainment For my wife and me, entertainment is pretty much one another and books. I am taking one teardrop camper's advice, though, and bringing speakers for movies on the laptop. A long afternoon of rain can be a great time to show a movie . . . and be able to hear the dialogue. The end analysis is not that the REI list is the ultimate authority on glamping. For my wife and me, it was a useful angle to consider when planning and examining our camping experience. We plan to leave Sunday afternoon to camp for five days again at Lake Sugema. My wife has lots of work to do, I'm bringing my bike, and we're also bringing our favorite tea mugs so we can wake up every morning to a hot cup of green glamping tea. Something like that--you get the idea. 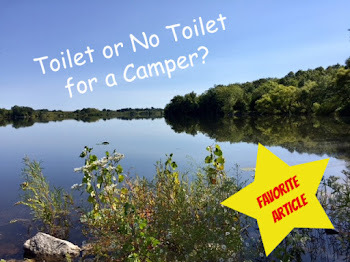 Toilet or No Toilet for a Camper? The question of "Should I bring a portable toilet with me when I camp?" seems to come down to "How icky is it to clean the toilet?" A recent post in the FB group Teardrop Camper Adventures received many responses regarding the following question: "My husband and I are looking into buying [a teardrop trailer]. Need thoughts bathroom or no bathroom? I love the look of the teardrops." So does a trailer need a bathroom/shower? Teardrops are too small for built-in toilets/showers. 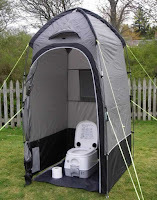 A portable toilet and utility (shower) tent is convenient for peeing during the night. During very cold (freezing) weather, a toilet with water has to be inside. What developed out of this idea was a debate on the definition of "teardrop" trailer. In order for the discussion not to move sideways, let's consider toilets for all "tiny" trailers, thereby eschewing the "What is a teardrop trailer?" debate. Some folks clearly choose no toilet. As one FB teardrop owner said, "Of all the things I want to take camping, a box of human waste is not one of them." Some tiny trailers have foot space inside the trailer (such as RTTC models) and are not all bed. For these, a portable toilet could fit inside the trailer if the owners weren't squeamish with the close quarters. The main sentiment for those naying toilets is that one can always arrange to be near a restroom, and that space can be better used than for a toilet. 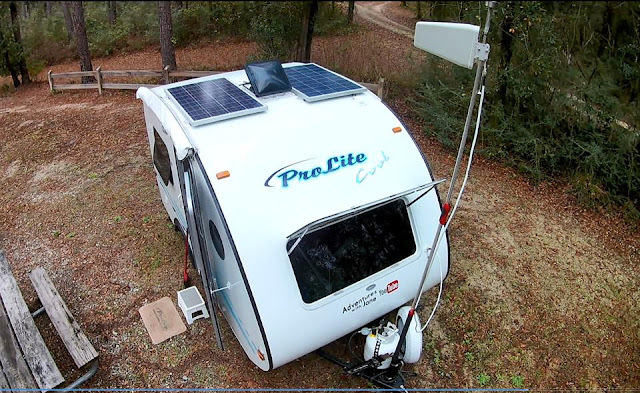 The Prolite Plus is a tiny trailer that has a toilet and shower, but at 15 feet and 6.5 wide, it certainly no longer fits the teardrop category, although it is smaller and lighter than most camp trailers. If you'd like to learn more about small trailers with bathrooms, the blog Camper Guide posted an article "10 Small Trailers with Bathrooms (We Review the Best)," which provides a list of some small (not tiny or teardrop) campers that are available on the market. Please remember that the blog post is just opinion; for instance, Prolite is not on the list. And for emergencies. Although there was a diversity of comment, the general consensus is that it's nice to not travel too far in the middle of the night to take a pee. This sentiment was concisely phrased by one tiny trailer owner as "If you don't camp in super cold weather, a potty tent would save you money and not take up interior space." There are several styles of portable toilets and utility tents available which have been reviewed many times on purchase pages and by bloggers. A couple of examples of portable toilets were mentioned by tiny trailer owners. Various models and levels of complexity are available. Shower tents, utility tents, changing tents--they have many names but are just a 4x4 standable tent, often used to hold portable toilets. Here are a couple of examples. Camping in temperatures below freezing has its challenges. Campgrounds shut down their toilet/shower facilities. Do you and your spouse "raise the bar" for time spent together? "Honey, can you hand me the toilet paper?" On the upside, pit toilets don't smell so bad when temperatures are near or below freezing. Ultimately, the larger question is "Why do we own a teardrop/tiny trailer?" The first two posts to this blog, "Why Such a Tiny Trailer?" and "Why Such a Tiny Trailer? Teardrop Owners Speak Out" speak to this question. What level of interaction with the natural environment do you want? What are your needs and tolerances? What makes you happy? "I don’t have a bathroom. Don’t want one either. But admittedly I’m weird about having to get up in the middle of the night. When I do I like taking my time and watching the stars and listening to the sounds of the forest. Sometimes I’m out a good half hour or more. I find I sleep better after doing so." "I was curious to see what other people would say because most teardrops don't have bathrooms. We are selling our teardrop because we are ready to upgrade to a full size travel trailer, and 99.9% of the people that have inquired about it that's the 1st thing they ask, 'Is there no bathroom??'" 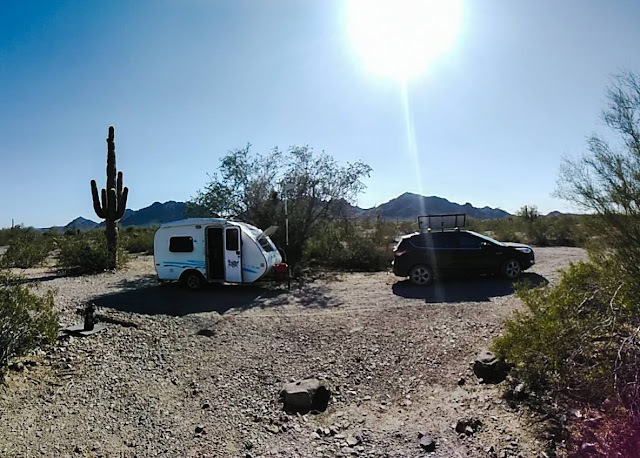 Most tiny trailer owners feel more constrained by maneuvering and maintaining a large trailer that is really a mobile apartment than by dealing without some of the conveniences we have readily available at home. One thing is sure--whatever our potty needs, there is a system out there that will accomodate them. I'll leave all the details to you. It is windy today at Lake Rathbun and Honey Creek Campground. After two nights of camping among the trees, I've moved today to the end of the South Campground loop onto the peninsula that provides a beautiful view of the lake. Spectacular . . . but windy without the shelter of the trees. 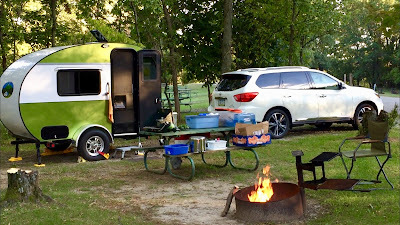 Honey Creek Campground has all the elements that my wife and I have been looking for in campgrounds--a beautiful view, lake or river, modern facilities, and a strong cellphone signal. My wife's not with me today (a Thursday) because she's home working at her consulting business; I'm out exploring for new places to camp and am so glad to have found this one, less than an hour and a half from home. Out here on the peninsula, the wind whipping waves and trees reminds me of the ocean, no barrier to discourage the blowing. I'm enjoying it but, really, am glad I spent the first three days and two nights a couple hundred yards up the road and out of the wind. It was more peaceful and restful; I had a peaceful, easy feeling there, whereas in my current spot for the next twenty-four hours, it's definitely going to be more exciting and stimulating. 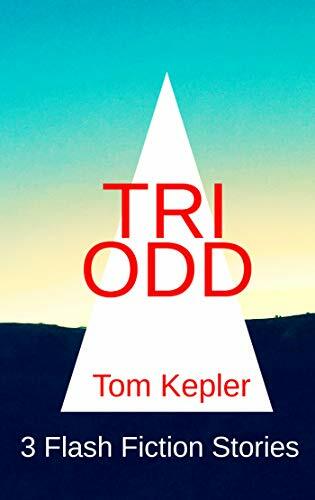 I plan to spend more time today reading and writing, though, so all is well. On Tuesday morning when I arrived, it began raining just as I was setting up. That was my fastest set-up ever, I think! That done, I spent most of the day inside reading and writing. My smaller ice chest was also inside, so I snacked for the day--potato salad, chips and hummus, pistachios, bagels and cream cheese, cold cereal and bananas--and hot tea. On Wednesday it was beautiful, blue sky and no wind, so I cooked well, set up the outside camp, and explored on my bicycle, a great day of exploration, exercise, and easy campcraft. Also creativity! I spent the day taking photos and video snips so that I could make a video of the campground and area, using my iPhone and the iMovies app. I really like this app. It is easy to use and has the capacity to refine and edit to create a better product. The video I created is below. My wife and I will definitely come here again. 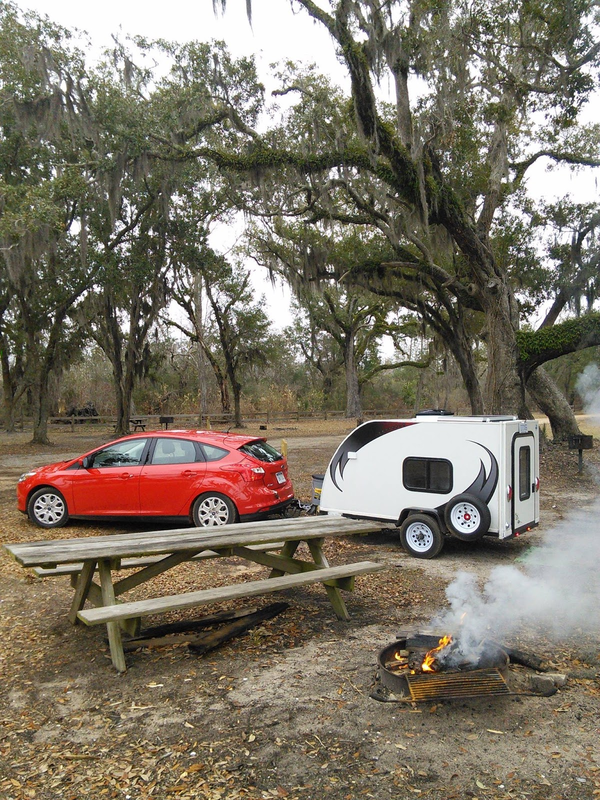 Honey Creek Campground is a sweet spot for camping. Lake Rathbun was created by the Army Corps of Engineers, and is one of the largest lakes in Iowa. Next year my wife and I will also have fun exploring some of the Corps' campgrounds on the lake. Honey Creek State Park is run by the Iowa DNR. For now, since it's warming up, I'm going to go out to take a walk--crosswind.